Bone fractures are very common and it is estimated that 700,000 bone fractures are occurring every year. It is estimated that 500 persons per 100,000 persons in the age group of 50 to 55 are affected by bone fractures. This rate increases 1260 the age group of 85 years or above. Bone fractures of the vertebrae may occur as a result of weakness in the bone caused by osteoporosis which is medical condition which makes the bone fragile and brittle due to shortage of calcium or vitamin C.
Vertebroplasty is a surgical procedure intended to stabilize vertebral fracture and thereby relieve the patient from the severe pain caused by the vertebral fracture. 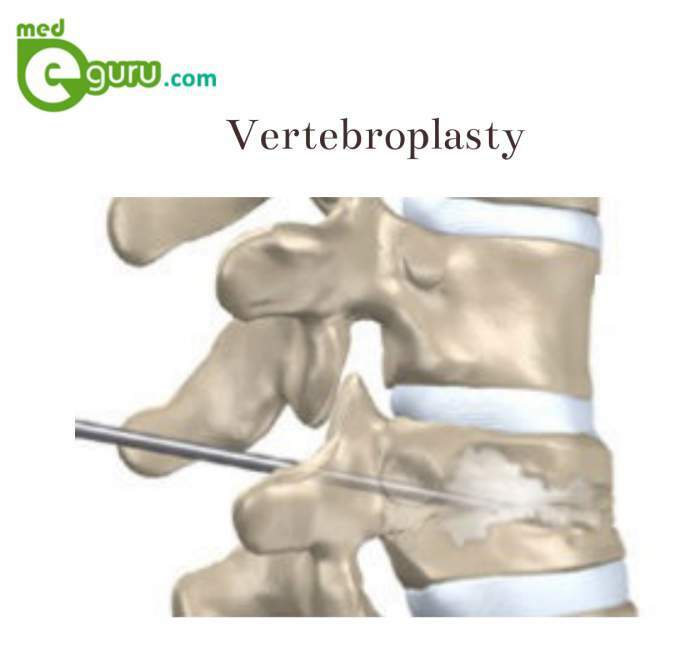 Vertebroplasty is a minimally invasive surgical procedure in which only a small puncture in the patients skin is needed to complete the procedure as against an open incision needed in other cases. In this procedure it takes only one hour for the completion of the surgery. This procedure is usually done under local anesthesia. Through a small puncture at the back of the patient a biopsy needle inserted to the artery of the patient and the same is carefully guided to the damaged vertebra with the help of a fluoroscope. Acrylic bone cement specially prepared for this purpose in injected directly to the vertebra under high pressure. This acrylic bone cement fills the cavity in the vertebra and forms a case within the vertebra. The needle in now removed. The cement solidifies I about 10 minutes. Thus the cement is filled in the gaps of the fractured vertebra forming part of the vertebra. The needle is now withdrawn and the puncture is covered by a bandage. After the healing of the cement the patient is free and he can go home on the same day. Patients are expected not to drive the vehicle themselves when they return to home and they are advised to stay in the hospital overnight if their home is far away from the hospital. 24 hours bed rest after vertebroplasty is recommended. Gradually activities can be increased and all medications can be restored. Some soreness will be felt in the puncture sire for a few days. This can be relieved by using an ice pack. They are also advised to increase their normal activities normally. 90 % the pain will be relieved within one or two days. Recent studies have shown that relied obtained from pain after vertebroplasty will last for three years from the date of the procedure. Complications and risks in vertebroplasty is less than 3%. Infection, bleeding and increased pain in some cases are the probable risk factors. Venous blood clotting compression of spinal cord or root nerve due to the extrusion of cement into the vertebral canal, blockage of artery in the lungs due to more blood clotting etc are also possible dangerous situations than can occur after vertebroplasty.